You will need Composer, git and PHP 7+ set up on your local machine. Basic knowledge of PHP will be helpful. Slim framework took off in 2013 when Josh Lockhart released the first version of the framework. The idea was to create a PHP micro framework that helps PHP developers quickly and easily write web applications and APIs. Over time, Slim has risen to risen to the point of competing with other PHP frameworks, like Laravel, Symphony, Codeigniter amongst others. In this tutorial, you will learn how to build a voucher pool microservice application using Slim 3 framework. We will build a voucher pool which will be a collection of voucher codes that customers can use on a website in order to get discounts. When a customer uses a voucher code once, we want to know who used the code and when it was used. Part one of this article will focus on our application setup and how to create our database migrations. For a given special offer and an expiration date, we will to generate for each recipient a unique voucher code. We need to provide an endpoint, which will receive a voucher code and email and validates the voucher code. In vase it is valid, return the percentage discount and set the date of usage. For any given email, we need to return all valid voucher codes with the names of the user and the name of the special offer. To set up Slim 3, we will use a Laravel-like boilerplate. If you use Laravel a lot, you will like this boilerplate. Run this command in your project directory. You will notice you have a new project in your project directory. Next, navigate into the directory and install third-party packages needed for our application to work. 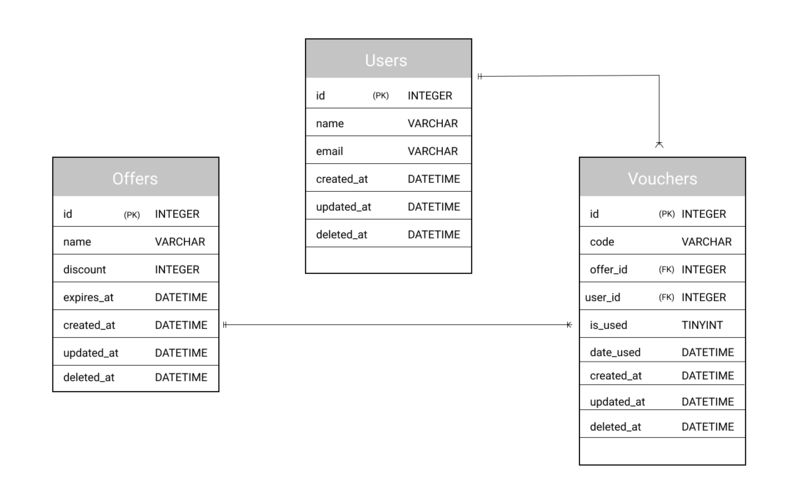 Since we have a Laravel-like structure, we can as well integrate Laravel's eloquent ORM and enjoy the goodness of manipulating our database using object-oriented paradigm. Once this is done, our application needs to know how to handle Eloquent queries. To achieve this, create a database file inside the bootstrap directory. This command will create a migration folder inside of a db folder. suffix: ".db"    # Defaults to ".sqlite3"
This command will create our users migration file inside the db/migrations/ directory. In this tutorial, we have looked at how to set up our Slim 3 framework application. We set up our application to use Laravel’s Eloquent to communicate with our database. We created our database schema and we set up Phinx to help with our migration files. Finally, we included a validation package to ensure that users submit the right data to our API. In the next tutorial of this two-part series, we will proceed to build our controllers and models. We will also create endpoints and test the output data using Postman. The source code to the application in this article is available on GitHub.